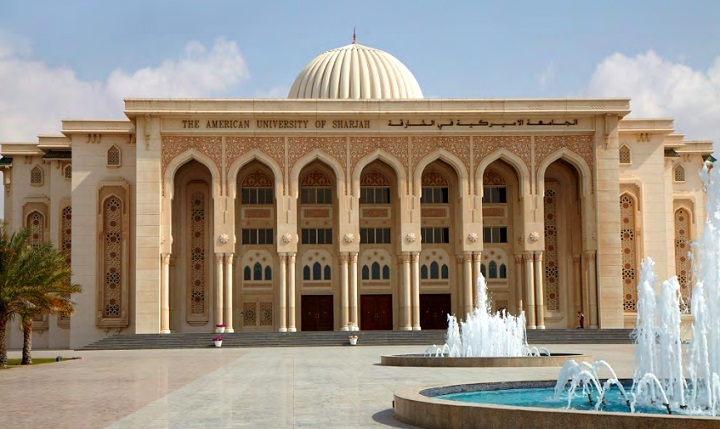 The American University of Sharjah is an independent, not-for-profit coeducational institution, based consciously upon American institutions of higher education. The university is a leading comprehensive coeducational university in the Gulf and serves students from the region and from around the world. AUS aims to be the region’s leader in higher education, known for excellence and innovation in teaching, learning, research, and service. The American University of Sharjah is located 16 kilometers (10 miles) from the center of Sharjah and about 25 kilometers from the neighboring emirate of Dubai. Sharjah is a global trade center and a city of learning and the arts, as confirmed by its 1998 UNESCO designation as the Cultural Capital of the Arab World. Our faculty members have years of teaching and research experience and degree qualifications from some of the most prestigious universities in the world. These include Harvard University, Yale University, University of Cambridge, University of Oxford, Stanford University, Brown University and Princeton University, to name a few. Approximately 92 percent of full-time faculty hold a terminal degree, while 81 percent hold a Ph.D.
Financial Grant (5–50 percent remission on tuition, lab fees, and shared accommodation) for full-time undergraduate students with proven limited financial resources. Distinguished Student Scholarship (20 percent remission on tuition and lab fees) for first-time students who have achieved distinction by achieving a minimum cumulative average grade score of 95% or its equivalent in the final year of their secondary education. Academic Accomplishment Scholarship (10 percent of tuition and lab/technology fees) for first-time students who demonstrate academic excellence by achieving a minimum cumulative average grade score between 90.00 and 94.99 percent or its equivalent in the final year of their secondary education. Active Student Scholarship (up to 50 percent remission on tuition and lab fees) is awarded to talented students as a gesture of the university’s support and acknowledgment of student achievements in the extracurricular field. Athletic Scholarships (up to 50 percent remission on tuition, lab fees, and shared accommodation) offered to talented student-athletes who demonstrate athletic excellence and outstanding sports qualities. 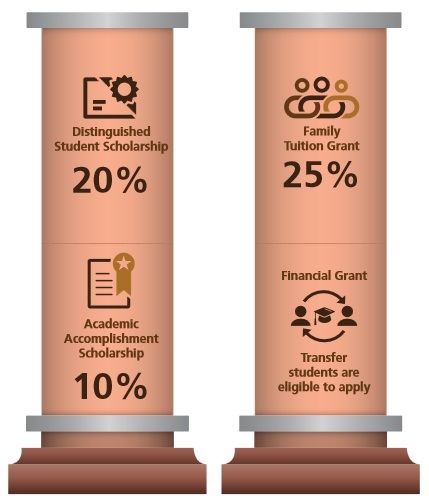 Family Tuition Grant (25 percent remission on tuition and lab fees) for families with more than one daughter/son enrolled simultaneously at AUS as full-time undergraduate students. Other scholarships and grants include the Chancellor’s Scholars Award, the Study Tour Grant, the Academic Accomplishment Scholarship, the Chancellor’s List Scholarship, Dean’s List Scholarship and the Sharakah School Scholarship. The university also awards a number of graduate assistantships to qualified graduate students. Graduate assistantships cover tuition fees (from 33–100 percent tuition waivers) and a monthly stipend during regular semesters. Graduate assistantships can be in the form of a Graduate Research Assistantship or a Graduate Teaching Assistantship. Graduate Research Assistantships provide students with opportunities to develop research experience by working with a faculty member on research-related activities. Through Graduate Teaching Assistantships, students gain teaching-related experience through part-time employment in positions such as lab assistants. Both are awarded on a competitive, semester-by-semester basis. On-campus facilities One of the most important and well-known features of AUS is its vibrant and dynamic campus life. The university offers students full-facility dormitories, a sports complex, and a gym. Other amenities include a health center, a pharmacy, a bank, a post office, a barbershop, a ladies beauty salon, a bookstore, dining outlets and two convenience stores. The residential halls give students a place to live, relax, exercise and study in comfort. The University Health Center provides a range of services including outpatient care, health education, psychological counseling and ambulance/emergency services. AUS sports facilities host a variety of recreational and competitive athletic activities. The Sports Complex features indoor basketball, volleyball, handball, badminton, tennis indoor courts in addition to a 50-meter Olympic indoor pool, squash courts, fitness centers and an exercise hall. The outdoor facilities include basketball courts, tennis courts, a soccer field, a cricket ground, a baseball field and a 400-meter running track. Extracurricular activities, student clubs and organizations AUS places a great deal of emphasis on extracurricular activities, considering them to be vital for a student’s all-around development. Students are encouraged to participate in sports activities, join cultural and interest-oriented clubs, and volunteer in community service campaigns. The university offers 81 cultural and interest-oriented student clubs, 25 sports teams and a community service volunteerism program. Students can also participate in theatrical and musical performances through the university’s Performing Arts Program. Throughout the year, a number of cultural performances are held on campus. World-class scientific research and publications AUS is committed to becoming the top research university in the region, known for its excellence and innovation. The university encourages and supports the research, scholarly and creative activities of its faculty and students. In addition, plans are underway for the university to build a research and technology park. The research funding at AUS includes AED 2.5 million awarded per year as Internal Faculty Research Grants; AED 2.2 million allocated per year for sabbatical leaves; AED 10 million (tuition waivers and stipends for graduate research and teaching assistants) allocated for graduate student support; and AED 2.1 million per year is secured on external research grants. AUS faculty and student produce and publish high-quality work that regularly gains recognition both regionally and internationally. AUS faculty members own 67 patents, many patented both locally and internationally. AUS faculty members have a strong record of scholarly publications in prestigious journals and international conferences that normally involve graduate students as co-authors. Career and professional development opportunities AUS also places great emphasis on establishing mutually beneficial links with the community. All the colleges and schools at AUS strive to cater to the needs of the corporate community and establish connections that prove to be of benefit to both AUS as well as its partners. These ties also help the university conduct research as well as promote a culture of research that is fast becoming one of the university’s most admired features. AUS alumni work in a number of multinational firms, NGOs, and governmental institutions. While at AUS, students have the opportunity to intern at leading local and international firms. The university also hosts an annual Career Forum and provides AUS seniors and alumni the opportunity to meet representatives from the private and public sectors interested in recruiting AUS students and graduates as either full-time employees or interns. AUS offers 26 majors and 45 minors at the undergraduate level, and 14 master’s degrees through the College of Architecture, Art, and Design; the College of Arts and Sciences; the College of Engineering; and the School of Business Administration. On-campus housing is the most convenient place for students to live in while studying at the university. More than 2,000 students live in the campus residence halls. They enjoy being close to academic buildings, library, food court and Sports Complex. The AUS residential halls consist of eight men’s and five women’s dormitory buildings, supervised by staff on a 24/7 basis. Students have the option of private, semi-private, shared, single or double rooms. The living environment is very rich in its multicultural atmosphere and has a balanced mix of social and academic activities. The residential halls give students a place to live, relax, exercise and study in comfort. Renowned as one of the premier libraries in the region, the AUS Library provides collections, services, and programs to support the curricular and research needs of the university community. The AUS Library offers 140 computer workstations; instruction in information literacy and research skills; 141,000 book /media items and access to 220,000 e-books; and 50+ databases with access to 26,000+ e-periodicals. In addition, all librarians and library administrators at AUS hold accredited master’s degrees in library and information science from institutions accredited or recognized by the American Library Association. Our MSA program opens up an exciting new opportunity in accounting and provides a fast track to prepare for some of the most prestigious credentials in the profession. Our Master of Science in Accounting (MSA) program provides students with advanced knowledge and techniques to pursue professional careers in public and private accounting. MSA students develop skills necessary to solve accounting problems that are of contemporary relevance to the fields of accounting, finance, and other business areas. Our Master of Science in Chemical Engineering (MSChE) will prepare you in a learning environment that combines chemical engineering practice with technical research so that you can play an active part in contributing to the growing body of knowledge, research, and development, both regionally and internationally. In this program, you will gain excellent all-around technical, analytical and practical skills to handle major assignments in the chemical engineering field. Our master's degree in chemical engineering is based on high standards, similar to those followed in the United States. The mission of the Master of Science in Civil Engineering (MSCE) program at AUS is to prepare professionals for advanced careers and/or doctoral studies related to civil engineering. The program strives to create a conducive academic environment that promotes excellence in teaching and research to assist the students in becoming competent, innovative and responsible professionals with effective communication skills. An increasingly more vital part of everyday life, computer engineering relates to how some of today's most innovative devices are created. An academic path distinct from a graduate degree in computer science, which is the systematic study of algorithmic methods for representing and transforming information, computer engineering relates to the design and prototyping of computing devices and systems. Popular among professionals throughout the region, our program prepares students in an environment that combines electrical engineering practice with cutting-edge technical research that enables our students to play a leading role in contributing to the growing body of electrical engineering knowledge, research, and development, both regionally and internationally. Since its launch in 2002 as the first program of its kind in the entire region, our Engineering Systems Management (ESM) master's degree has become one of the most popular graduate degrees at AUS. The demand for our program remains high with an average of 25 students enrolling in it every year. Our Master of Science in Mathematics (MSMTH) program provides students with rigorous and thorough knowledge of a broad range of pure and applied areas of mathematics. Our program is designed to train students with different professional goals ranging from employment or career advancement in business, industry or government, to basic training in foundations needed to obtain a research career or pursue a Ph.D. in mathematics or mathematics-related fields. Accredited by the UAE Ministry of Higher Education and Scientific Research, our Master of Science in Mechatronics Engineering is an interdisciplinary program that integrates the science and engineering concepts needed to address grand challenges in the ever-changing industrial sectors.